Turkey Elections: Erdogan Wins 2nd Term Recep Tayyip Erdogan's victory ushers in a powerful new executive presidency eliminating the prime minister's role and granting the leader the ability to rule by decree and dissolve parliament. Supporters of Turkey's President Recep Tayyip Erdogan gather in front of the Huber Presidential Palace, where he delivered a victory speech. Preliminary results indicate Erdogan has avoided a runoff. "Winners of June 24 elections are Turkey, Turkish nation, sufferers of our region and all oppressed in the world," he said to cheering crowds, adding that the country "will look at its future with so much more trust than it did this morning." Erdogan also claimed the AKP, and its allied Nationalist Movement Party, the MHP, had retained their control of parliament. Early Monday morning, the Supreme Election Council announced Erdogan received the absolute majority in the presidential election with 53 percent of votes after 97.7 percent of ballots had been counted. 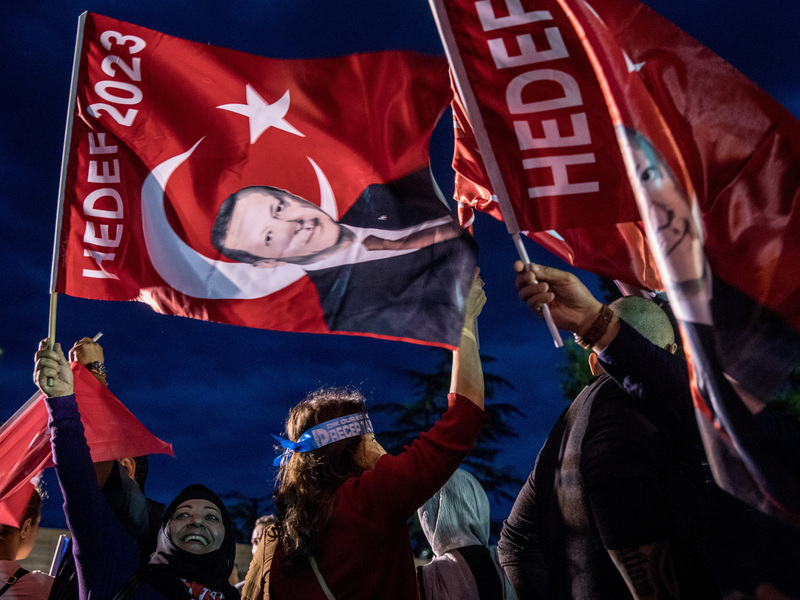 The win allowed Erdogan to escape a runoff against his closest rival, Muharrem Ince, who posed the greatest threat to ending Erdogan's 15-year political dominance. Ince, a former teacher-turned-lawmaker with the Republican People's Party, the main secular party known as the CHP, garnered 31 percent of votes, according to election officials. As of Monday morning he had not conceded the election and urged election observers not to leave ballot boxes. Erdogan's victory ensures he'll stay in office for 20 years — until 2023 — and ushers in a powerful new executive presidency that eliminates the prime minister's role. The current prime minister, Binali Yildirim, said he expects he'll be appointed vice president. The expanded authority of the office is the result of constitutional changes narrowly approved in a referendum last year, which will afford Erdogan autonomy to directly appoint top public officials. He'll also have the ability to rule by decree, intervene in the country's legal system and dissolve parliament. Additionally, as NPR's Peter Kenyon reported, the new system grants Erdogan the possibility of running for a third term "should parliament call snap elections in his final term." The AKP says the changes are intended to make Erdogan's government more efficient and workable while he enacts rapid reforms that are fundamental to his agenda. Critics say it is a blatant power grab and pushes Turkey closer to authoritarian rule. Sunday's elections were supposed to be held in 2019, but Erdogan moved them forward by more than a year. Throughout his presidency, Erdogan has reintroduced Islamic conservatism to civic institutions in a quest to forge a "pious generation." After a failed coup in 2016, tens of thousands of people were arrested and about 150,000 public servants and soldiers were fired from their jobs. One of his primary campaign promises was to lift a state of emergency he imposed following the coup attempt. "Starting from tomorrow, we will be in a rush trying to deliver on promises that we have made to our nation," he said Monday during the early morning victory speech.